Invited to the National Congress of Passive Building to be held on April 16 & 17 at the Porte de Versailles in Paris, Peter Gallinelli will talk about the passive igloo. 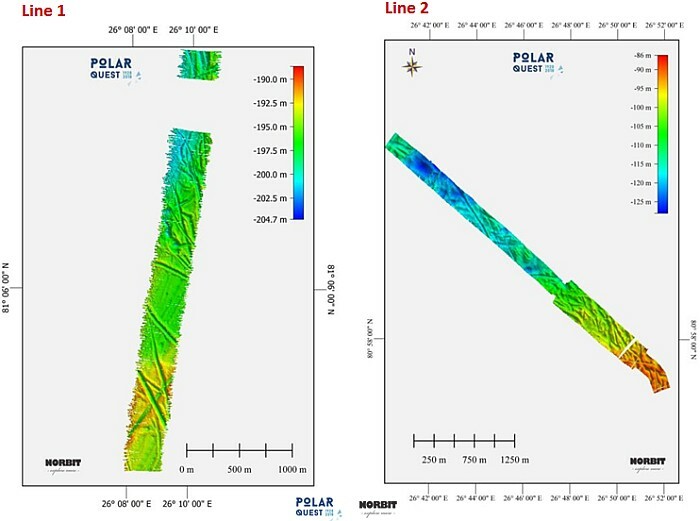 While searching for the lost airship north-east of Svalbard, an unexpected observation was made: deep 'scratches' can be observed in the seabed. 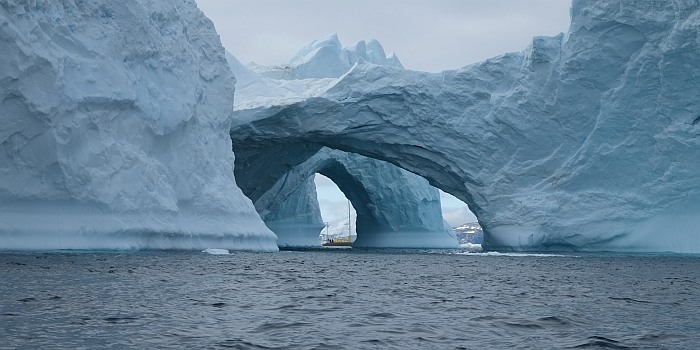 These are thought to be due to the keels of partially stranded icebergs or ice sheets. Most likely they come from the Ice Age (Pleistocene). In the Western Spitsbergen these kind of bottom structures were dated for 24 000 years (Zhao et al., 2017, Quaternary Science Reviews161). The whole Team Nanuq wishes you a healthy and happy 2019. Scientific results and geographical perspectives. 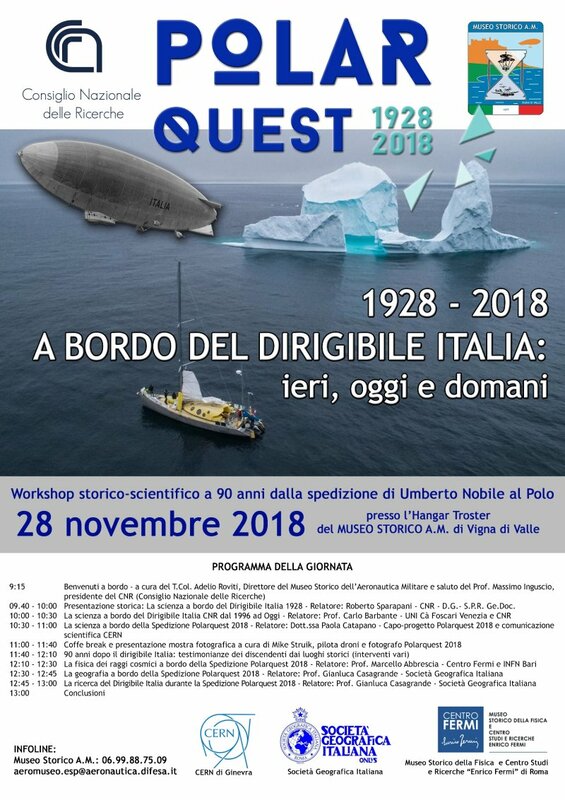 Historico-scientific workshop at the occasion of the 90th anniversary of the Nobile expedition to the North pole. 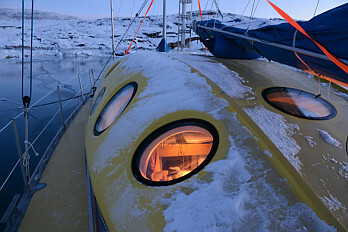 The passive igloo provides logistical support, a base camp and floating laboratory for researchers motivated by an interest in research in the Arctic regions, whether for scientific stays in otherwise inaccessible places, navigation or during the the winter, when the boat is caught in the ice. The season is coming to an end. After a short autumn cruise, Nanuq has arrived in her winter camp in the dazzling Vesteralen, not far from the Lofoten Islands. 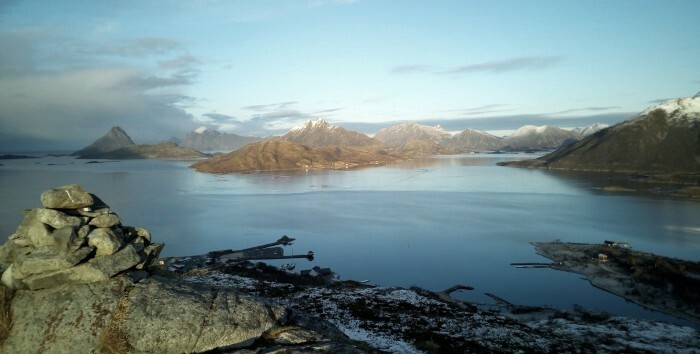 The first ice covers the fjords, the sky is clear and while the low sun still warms at noon, the nights are crisp with temperatures close to -10 °C. We are warmly welcomed in Fjordcamp where our place is reserved to spend the winter. The site is well organized with cozy cottages and hot showers. The reception is very warm. We are surprised to see no visitors in this fantastic season of colors and change. After five days of setteled weather and sunshine, it is snowing. Nanuq is waiting for the adventures and projects to come. She is counting on you! Nanuq is waiting for next seasons projects to come. If you would like to join the adventure, get invoved > contact. 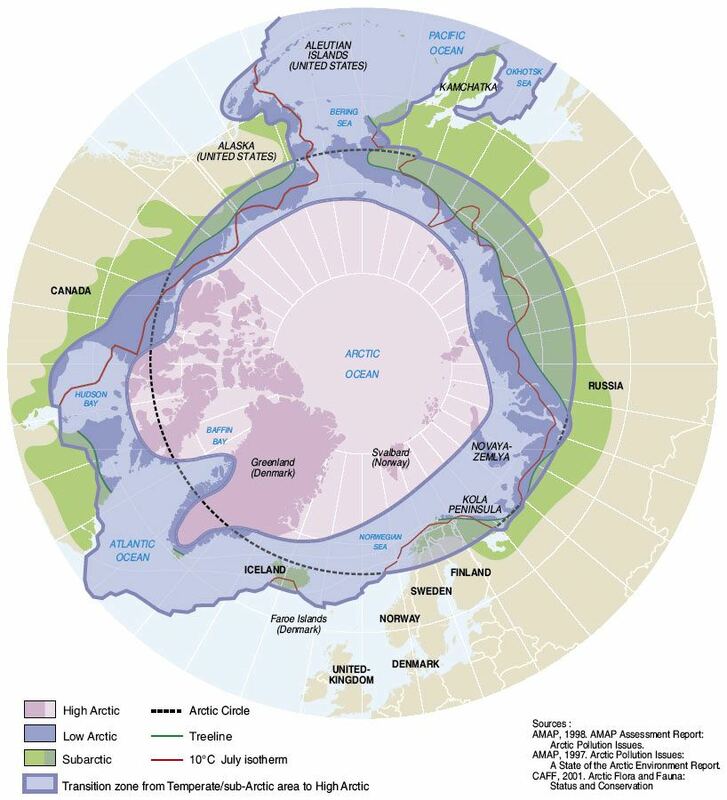 Back from the Arctic expedition, the opportunity was given to share the observations made on Nanuq at the edge of the Arctic ice shelf and to raise awareness of a major environmental issue. 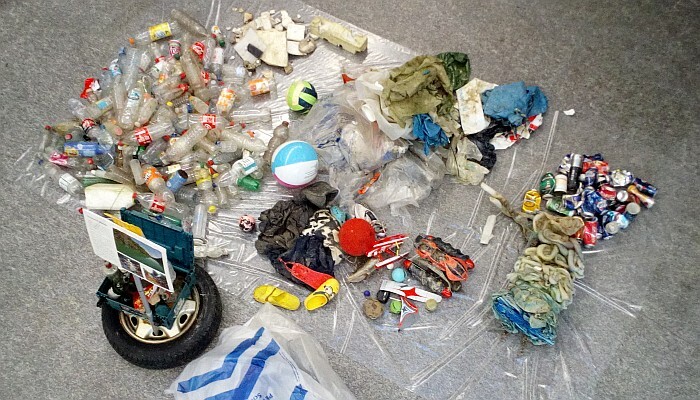 During a week dedicated to sustainable development, a student workshop focused on microplastics. Below an installation made by the students from waste collected during an observation and cleaning campaign on the banks of the Rhone: the problem has no borders! Dear Nanuq friends, the english part of the news are not available. Please come back later or have a look at the french part here. Clip by Dorothée Adam on board Nanuq, summer 2017. This work made it possible to realize the magnitude of the problem. 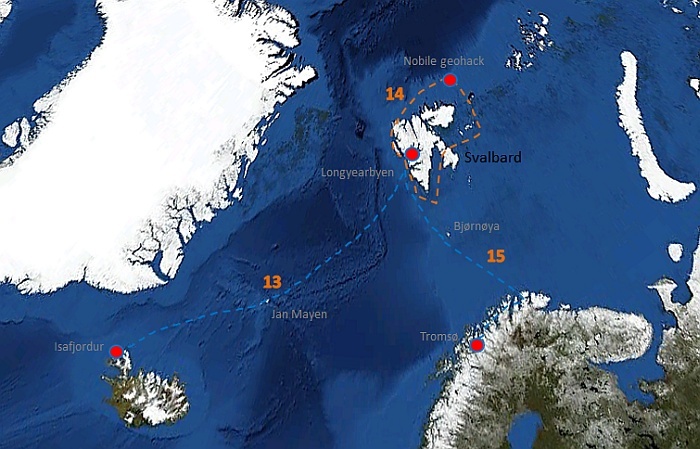 In 2018 Nanuq will take samples all along the way, from Iceland to Svalbard. 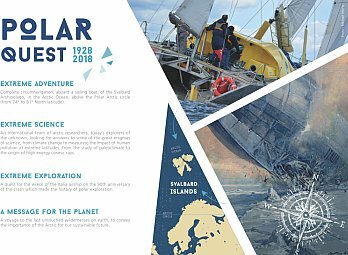 Follow the adventure on PolarQuest2018 and bring your SUPPORT. Designed according to the principles of the passive building, the passive igloo project has shown that active heating is not necessary in temperate climates such as central Europe and could reduce heating energy in Arctic housing by 10. But the project also goes beyond the issue of energy self-sufficiency and addresses complementary aspects that are no less vital such as food, water or waste management. Thus, the passive igloo project becomes a complete laboratory of autonomy and is likely to give inspiration to housing design and expedition planning in remote and cold places. Une conférence qui traite de la (sur-) vie dans le Grand Nord. 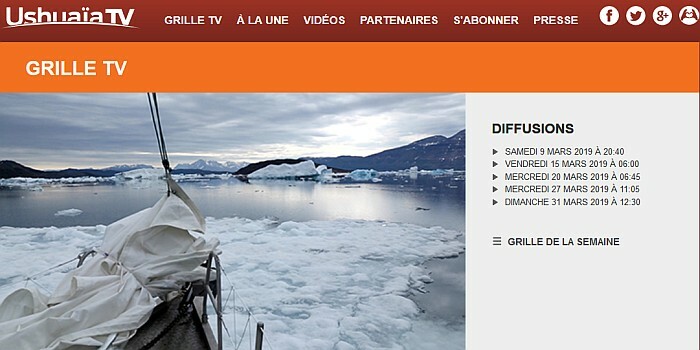 Parti vivre avec son fils pendant une année sur son voilier pris dans la glace au nord du Groenland, Peter Gallinelli raconte les aventures vécues dans un milieu à la fois hostile et miraculeusement vivant, la nuit, le froid, les rencontres... mais aussi les effets du réchauffement climatique et d’une certaine modernité. 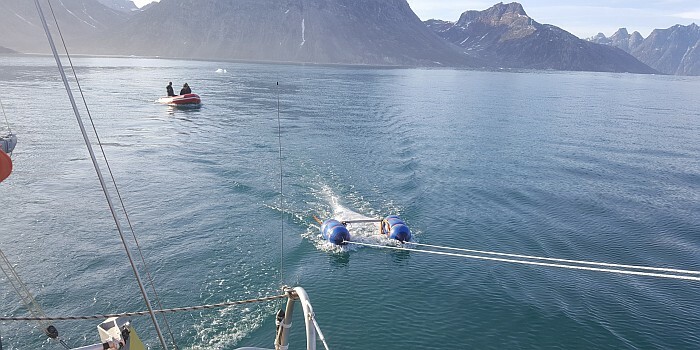 Continuing the scientific projects and partnerships launched since 2015, summer 2017 was the occasion of a micro-plastic sampling campaign using the Manta trawl which is now part of the Nanuq inventory. 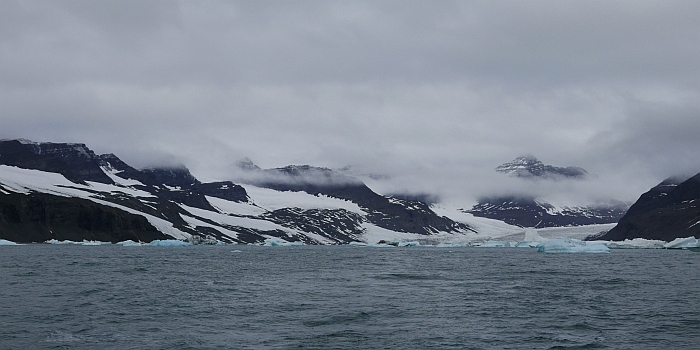 The abundance of ice, plankton and jellyfish made it difficult to collect samples. 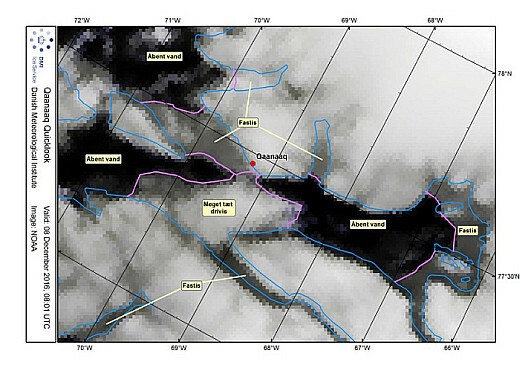 However, observations were made throughout the voyage, ranging from the West to East-coast of Greenland. After leaving the coast of Blosseville and a shaky crossing, we reach the north-west coast of Iceland, at only 180 miles distance. We discover a country whose sweetness and abundance of life contrast with the mineral, glacial and forbidden coast that we have left a day ago. We are exploring the NW-fjords. At a temperature of 10°C the water is warm. The weather is calm. The volcanic mountains are covered with vegetation and even bushes. Blueberries are abundant. The mussels are excellent. We alternate between sailing in settled weather and hiking along the paths that linked the isolated farms that are now more and more invaded by swamps and have returned to the wild. The decor is grand and immense. 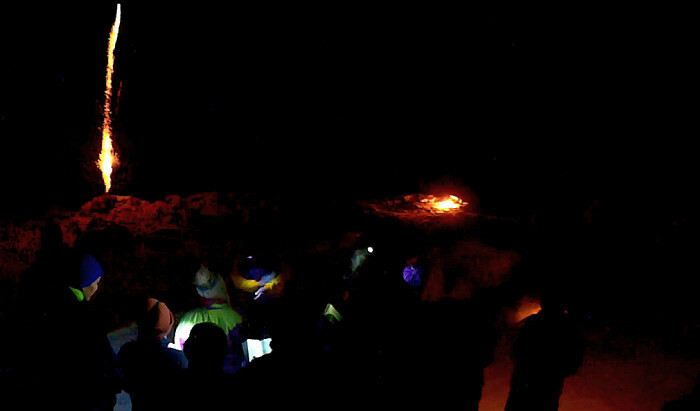 A one-hour walk easily transforms into a one-day hike ending at the glow of our head lights. 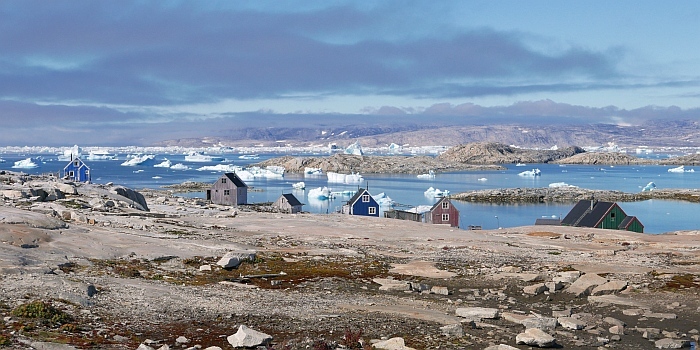 The contrast makes Greenland appear like a mirage or a crazy dream. But the satisfaction and the images imbued in our memories testify to the reality of the weeks spent sailing along one of the wildest coasts of the northern hemisphere. We'll have to come back! As by now, Nanuq is awaiting the new adventures to come under the benevolent gaze of the inhabitants and the gusts of a gale that sweeps the small town of Isafjordur. The sky is low and it rains horizontal. In a few hours the little twin-engine will fly us home to civilization, 'imaqa'; which does not mean perhaps, but certainly - conditions permitting ... the loop is closed. The new crew is embarked and we do not lose a minute to cast off. The weather forecast for the coming days is excellent and we have promising ice information (see the DMI and EOSDIS). 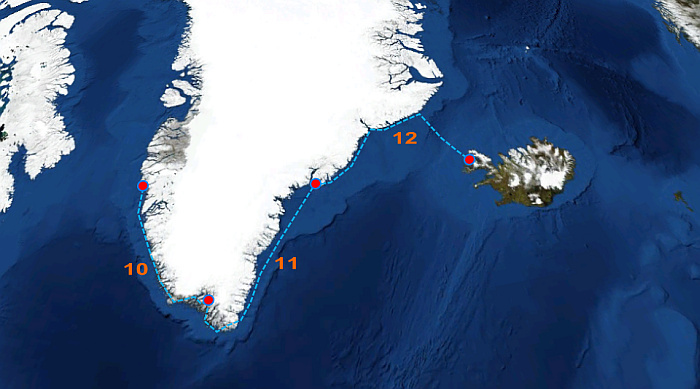 We will have do deal with it; this year the ice is late and benches stretch 60 miles from the coast, barring the direct route to Kangerdlugssuaq, a big fjord that marks the coast halfway between Tasiilaq and Scoresby Sund. A 250-mile leg allows us eventually to get around it and enter Kagerdlugssuaq under a fairy-tale morning mist. 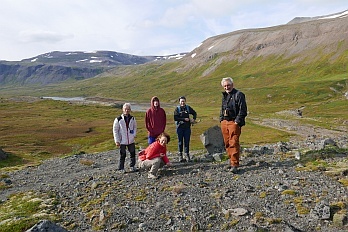 We use the day for explorations and visits, including the very active geologists' camp. This place, which seemed so abandoned in the past, has become a sought after spot, all proportion held: six scientists spend the summer there and a few sporadic visitors. After an incursion into the immense and ice encumbered fjord, we follow the Blosseville coast. Wild at will, the vertical headlands of dark volcanic rock named to well-known Arctic explorers are interspersed with unnamed valleys filled with ice and glaciers. 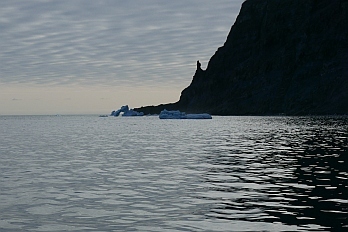 The summits of Greenland hide in the fog. We were advised: this is one of the wildest stretches of coast in Greenland, most of the time inaccessible due to weather and ice. The maps resemble schemes at most or simply don't exist. The sailing instructions summarize the 500 km of coast into one laconic paragraph. Once again, satellite photos are the most reliable back-up. This coast is discovered at random and driven by curiosity. 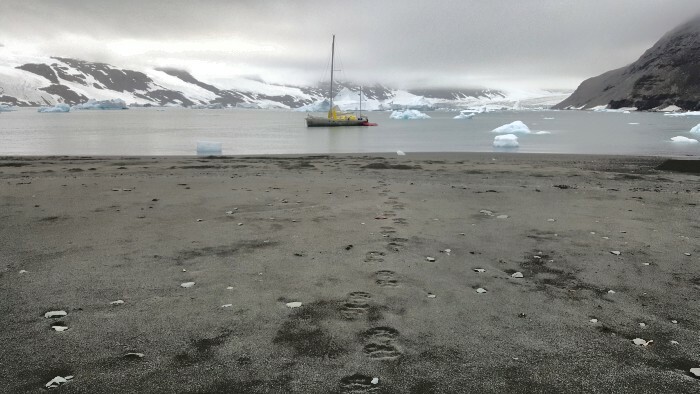 It makes us discover a perfect anchorage at the foot of a beach of black sand, sheltered from the swell. We are not alone; the traces of a polar bear witness. A last stop in the area dedicated to Swiss explorers, such as Grivel, Savary, Daussy ... and here we are, sailing to Iceland at two degrees of latitude further south, at the tangent of the Arctic Circle. We are in Narsaq to provision food, taste the excellent products of the local brewery with the evocative name of QAYAQ, bask in the hot shower of the hotel and do a laundry in view of the weeks to come. We are also still waiting for our replacement dagger board, whose transport from Europe has been delayed due to the collision of the cargo vessel with an iceberg that has shaken up all the logistics to Greenland. While our shipping company is doing the impossible to find a solution, we take advantage of the week to explore the fjords and discover the farms, experimental for some, that characterize the region. On July 30 we finally take delivery of the long awaited dagger board! Nanuq is ready for the coming weeks, cut off from civilization. We cast of from Qaqortoq, heading to the South and the East Coast. 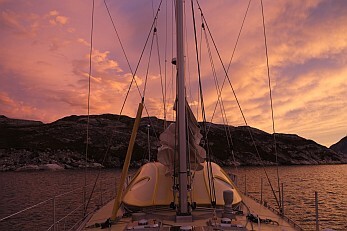 A day sailing takes us to Prins Christian Sund. Our patience is rewarded: the conditions are optimal after the passage of the last low pressure system provoking heavy gusts gushing through the fjords. 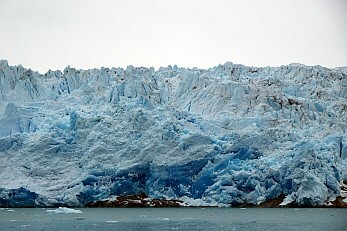 Renowned for its beauty, Alpine peaks mark this 50-mile strait that cuts short to the southern tip of Greenland, famous for its gales, ice and currents. We are preceded by a Norwegian sailboat that it is quickly blocked by a bench of ice for which its polyester hull proves to be unsuitable. Thus Nanuq opens the way and soon we feel the swell of the open sea, a sign that the way to the East is open. We make a last call to Aasiaat Radio which has accompanying us since 2015 before heading north along a coast that we discover. For nearly a week we huddle along this piece of inhospitable, wild and glacial coast that has long since been abandoned by its inhabitants. Only a few remains remind of human presence, such as a Loran station (long range radio navigation system from the sixties, more info here) or the ruins of a disused village. The weather is calm, with close to no wind and the sky is imperturbably clear. We sail northward to the Ammassalik region. The remains of more and more abundant sea ice make us progress at a slow pace, at times wrapped in a thick mist that only lets us see a few meters in front of the bow, making any strategy useless. 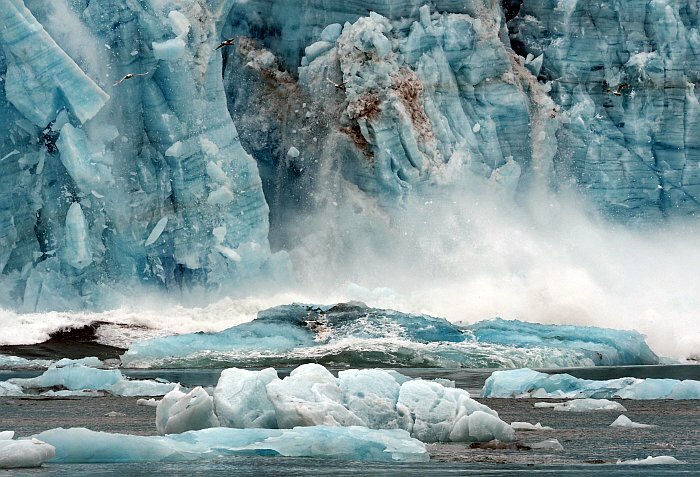 At times we find ourselves opening our way by pushing ice sheets and pieces of old ice. 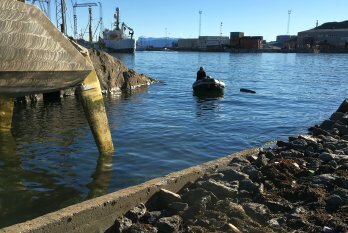 The AIS (Automatic Identification System) unveils other boats visiting the region that has become a destination of choice for visitors from Iceland ... and are blocked as well. Nanuq is now on her anchor in front of the small village of Kulusuk, three kilometres from the international airport, well, a simple dirt track used by the small two-engine Dash of Air Iceland and Airgreenland, conditions permitting. While waiting for the new crew, we catch up with our friends from our last visit in 2003. Nanuq on her way back to the sea after a long and cold winter in Maniitsoq. Her hull design snugly fits into the local fishing industry slipway. After an adventurous voyage from Europe to Greenland due to chaos in the European airspace, we eventually arrive in Maniitsoq where Nanuq is awaiting us for the season to come. 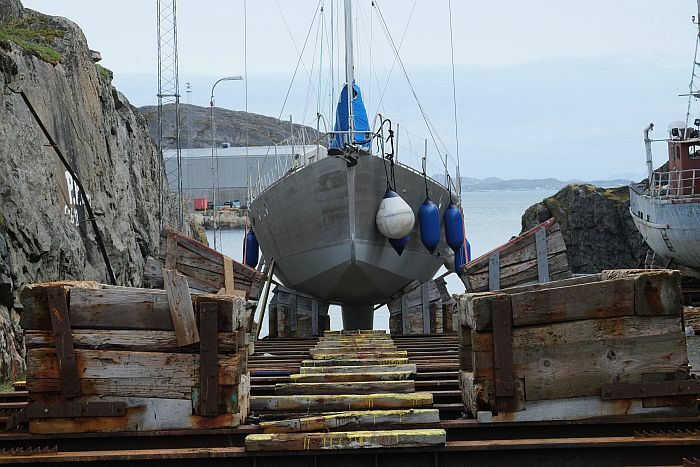 Our friends in Maniitsoq have arranged maintenance and repairs and after a short week of preparations we are ready to cast off for the summer 2017 expedition. 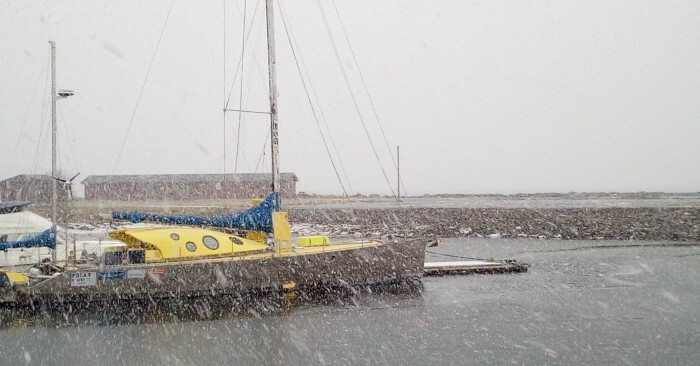 We have now left Maniitsoq two weeks ago, and Greenlandic summer has not yet begun. Numerous snow patches can still be observed at sea level and low pressure systems regularly move northwards over Baffin Bay giving us southerly gales. We often experience stratus and rain. 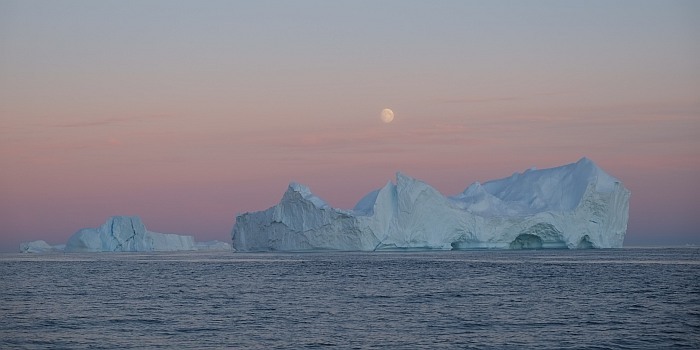 But Greenland is ever more beautiful. There is no bad weather, but only bad clothes. 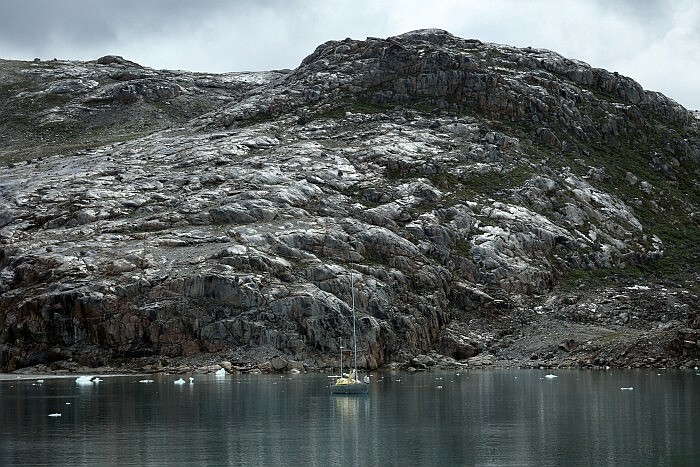 After a weeks sailing we ty up at Narsaq, in time to welcome Dorothée and Frédéric to start the scientific programme. We collect micro plastics and samples to analyse traces of PCBs in the water and the atmosphere. Ifremer and Oceaneye will take care of analysis once back home. We revisit places we saw on our way in 2015 and discover new ones. 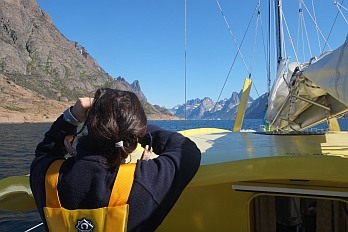 Dorothée takes care of documenting our encounter with the wilderness and how we manage navigation and everyday life on board with simplicity and self-reliance. Every day is completely different and life on board seems timeless. 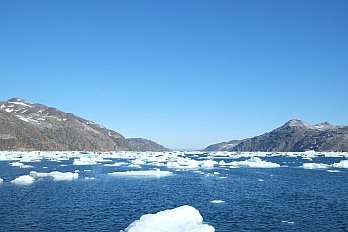 The last day of sailing to the head of Sermilik (fjord full of ice) makes us discover an amazing farm. Besides 800 heads of sheep, they grow potatoes and beet, also known as the apple of Greenland. We receive a warm welcome and are invited to share dinner with the family and workers in the amazingly modern farmhouse. In return, we invite our hosts for a visit on board and share our experience. 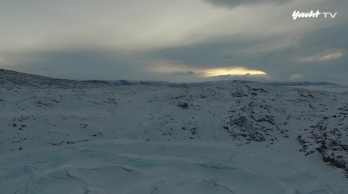 While we prepare to leave, an UAV drone is sent to say good bye - amazing Greenland! 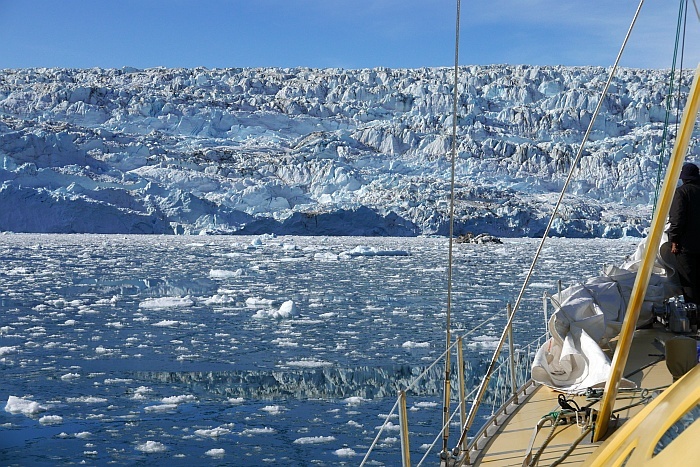 At present Nanuq is moored in a spectacular fjord situated at a couple of miles distance south of the small settlement of Qassiarssut, also knows as Erik den Roedes village, who settled there when he was banned from Iceland in the ninth century. The surroundings are alpine and steep. 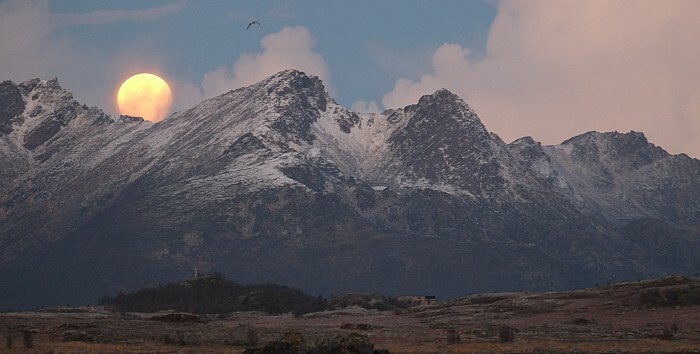 Snow covered mountains raise from sea level to almost 2000 metres altitude. The sheltered places at the bottom of the valley accommodate a dense arctic forest with arctic birch and shrubs. This surprisingly rich vegetation might be le last to be seen before sailing to the wild and icy East coast in a couple of days. Preview for a new season that is shaping up to 2018. 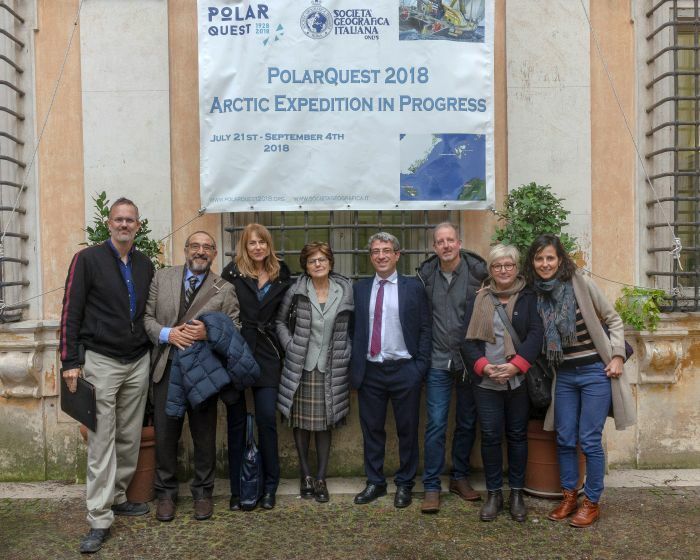 PolarQuest with a consortium of scientists will embark for the Svalbard archipelago and much more ... keep in touch. The departure from Maniitsoq is approaching at a great pace; The summer 2017 will see us pass Cap Farvel, sail up the East coast for a stopover in Tasiilaq before the crossing for Iceland. Boat and crew are ready. The equipment and spare parts are already sent to Greenland; After 3 years in the north and 3 Arctic winters there is a little maintenance on the program. We look forward to be on board of Nanuq, Greenland, the summer cool of the Arctic and our Friends. See you soon, for new adventures to come. 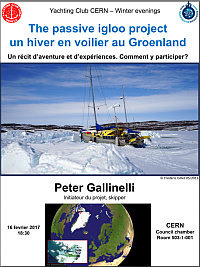 Peter Gallinelli will present the passive igloo project as well as the adventures aboard Nanuq, ranging from exciting navigation through the northern seas to an epic winter on the frigid coast of Greenland. What was the climate, how to cope with the cold, must one be crazy to set up such a project ... questions to which you will find answers in sound and images. "A winter on Greenland's North West coast becomes an adventure for father and son"
With special thanks for the drone images to Matthias Waurick; at -35 degrees below zero temperature a real challenge for man and the machine. 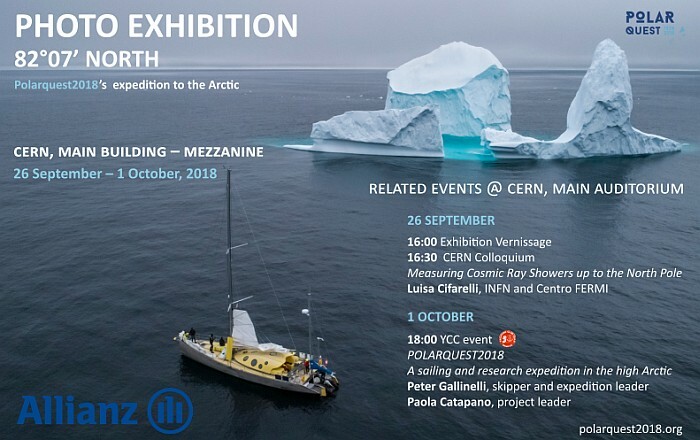 "Peter Gallinelli will present the passive igloo project as well as the adventures on board of Nanuq ranging from an exciting sailing through northern seas to an epic winter on icy Groenland shores. Please come with your enthusiasm and questions for Peter. 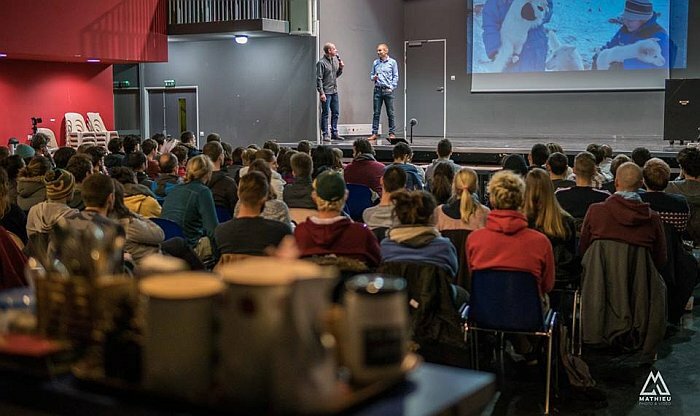 The conference will be followed up in the cafeteria for those of you who would like to learn more, specially on how to join as a crew on board of Nanuk." 365 days, 40 ° C, 5000km ... a world separates us from Qeqertat. 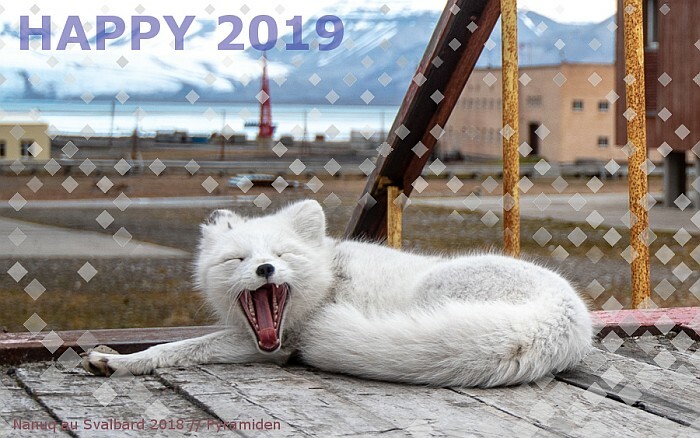 We look back to a year of exceptional adventures, discoveries and encounters and forward into a promising year ahead: the Nanuq crew wishes all of you a happy new year and exiting projects to come and to share. During these festive periods, we have a special thought for our Greenlandic friends experiencing an unprecedented heat wave. 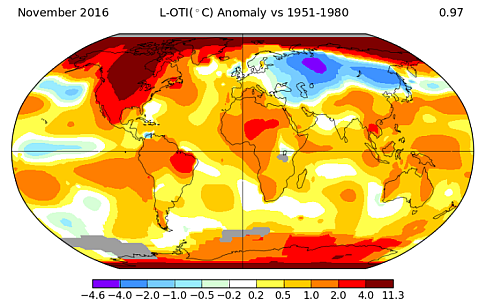 The analysis is without appeal: + 10°C for the high Arctic as compared to the reference period (1951-1980). 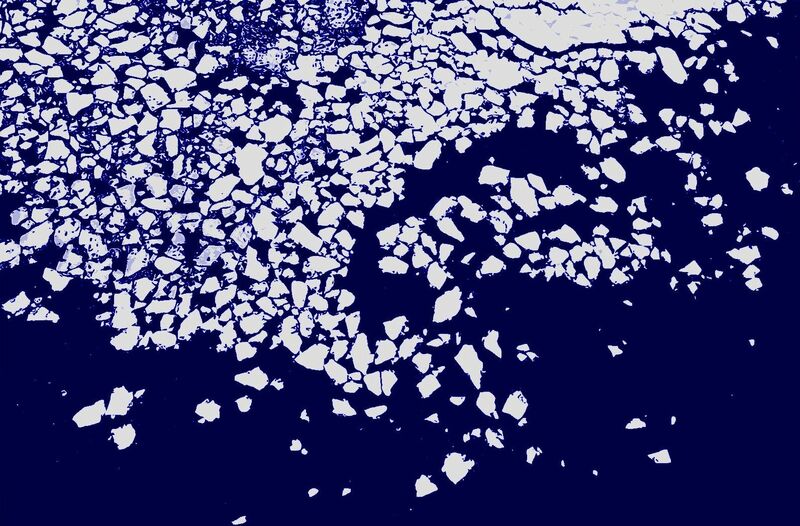 While in the 80s it still became 2-3 meters thick, in December the pack ice is not yet formed! The great fjord of Inglefield Bredning, which can usually be used for dog-sledging by mid-November, is still open ('Abend vand'): Christmas visits, fishing and hunting of a still nomadic people are compromised ... never seen before. 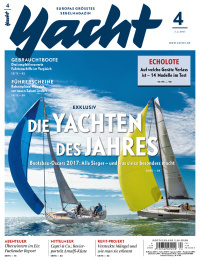 We have just learned that Janusz Kurbiel, 'captain' of the Vagabond'elle, has departed by surprise on August 22, only a few days after a moment of friendship at the head of a fjord on the west coast of Greenland. More than elsewhere, in the great north life and death are close to each other and remind us at every moment of the ephemeral nature of life. This is the price of freedom. But isn't a privilege to leave in peace in one of the most beautiful settings in the world? Bon voyage, Janusz. "If I have the choice, I take the more difficult"